I don’t support laws that ban plastic shopping bags because it ends up hurting people that cannot afford to buy reusable shopping bags. I’d rather a store or city offer incentives for using your own bag because I think you get more flies with honey than vinegar. That’s why I had to interview Teresa VanHatten-Granath when I heard about her Green Bag Lady Project. In an attempt to make her corner of the world greener, Teresa makes and gives away free cloth shopping bags! The project started in her own college classroom. 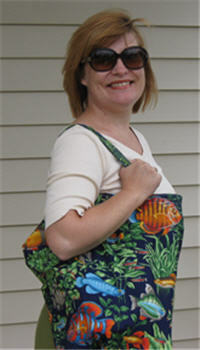 She now has people using her free cloth shopping bags around the world! Green Bag Lady Bag Number 111170. How long have you sewn? How did you get started making shopping tote bags? I started this art project in Jan/Feb of 2008. I am an artist/college professor but I mainly do photography and digital imaging (which is what I teach). This project could be classified as more of a "performance art piece." I do events where I go into public spaces, set up my sewing machine and give out bags as well as give them out on a daily basis. With Green Bag Lady, I would like more artists to think about the ecological impact of their art as well as producing work that has a direct, positive impact on the environment. I love that the audience is directly involved in this project. The project started one day when I was scolding my husband for getting plastic bags at the grocery and he said he had to because there were no fabric bags in the other car (we normally only use one car) so I decided to go through my fabric bins (many of them!) and dig out fabric that had no other use. I ended up with quite a pile and I just started making bags. They were not very uniform in size when I started, but eventually I figured out what size worked best and that is the size of the pattern I now give out as a pdf. I started by bringing the bags to the college kids in my classes and then my friends. It has just grown from there. It has now taken on a life of its own! Why did you start giving the bags out for free? I am adamant that I am NOT selling the bags or getting any compensation for them. They are a gift. I want the receiver to feel obligated to use them, that is why I require the promise to use them instead of paper or plastic. If one were to buy them from me, they become a commodity and there is no obligation any longer because the person owns the bag. A gift is owned by both people. I know that usually one bag is not enough but if I GIVE you one, you might start thinking about your usage and buy other bags to supplement your collection (and maybe even start thinking about recycling, composting, consumption and consumerism). My favorite comments are from people who say things like, "this is the push I need to go more green" or "I have been thinking about switching to fabric and this will help me do that!" or "I am going to start making them and give them to everyone I know" or "I am going to have my Girl Scout Troop make them." My team of about 12 sewers (aka "Bagettes") make between 100-200 bags per week. We meet nearly every Sunday afternoon to cut out, iron and label bags. The bags are then sent home with people to sew. Then we do events and give out the bags, explain the project and encourage people to stop using paper and plastic. We also do freebies on the website where anyone in the world can leave a comment for a free bag. Check back often to enter a freebie, we try to make sure everyone gets a bag if we have that many on hand. How do you know the people you give the bags to actually use them? Here is where we have to have faith in humanity. We do get photos of people using the bags and we post those on the site. I have also run into people using them. That is fun! How did you get started sending bags around the world? Honestly, I had no intention of mailing them anywhere. I thought I would just make them and give them to my friends and family. Then the story was on the news here in Nashville in the summer of 2008 as well as nationwide and in Canada. So, we started mailing them! My father, David VanHatten (aka "Bagette Dad") does almost all of the shipping now. He also funds the postage, what a GREAT dad! How do people send fabric donations to you? How much fabric is a good sized donation? What is the least amount of fabric you will accept? Do you accept thread or donations other than fabric? We would love to have thread donated. We also accept gift cards to places like Joann Fabric so we can buy serger thread (we go through a lot), machine oil, needles, etc. We have also had people send us postage stamps or a few dollars to offset the cost of shipping. We also love getting thank you cards and photos from people after they get their bag. Do you have any funny stories or comments about anything that's happened to you or your bag recipients since you've started this project? One thing that is funny is that people always ask how much the bags cost, even after we tell them they are free. We were at an event early on in the project and one woman insisted on knowing how much they cost. She kept asking, and then asked, "Well, if you DID sell them, how much would you charge?" We just kept saying they were free of charge and weren't for sale. I think sometimes people like to know the monetary value of something they get for free. Honestly though, they are priceless to us if it gets a person to start refusing paper and plastic when they go shopping. There is no monetary value on changing the way people think. When I shop at Trader Joe’s they put my name in for a drawing for free groceries if I bring my own bag. I never win the drawing but it's an incentive to grab a shopping bag from the trunk of my car before I run into the store. Target also gives you a few cents credit (I can't remember how much) if you use a reusable shopping bag. I put my bags on the belt ahead of the items I want to buy so they'll have the bag to put my items in. Sometimes this works well. Other times they try to ring up my own bag - oops! The mall? Not so much. I forget. This Christmas shopping season, I’m going to make a serious effort to use my reusable shopping bags for more than just grocery shopping. It’s also easier to smuggle Christmas gifts into the house in an unmarked bag. How do you remember to bring your reusable shopping bag with you? I have my bags in the car, but when they do end up back in the house, I put them in my rolling "bucket" - I take my bucket everywhere so the bags are just my back up if I do too much shopping. I end up putting a couple of bags in each car. And on my scooter and soon on my bike. Of course the baike will have Pannier bags. Warm a Winter Room with Free Heat! How Low Does Your Furnace Go? Reclaimed Barnwood Floors - Yea or Nay?